Nendo’s inventive take on the boring chocolate bar. 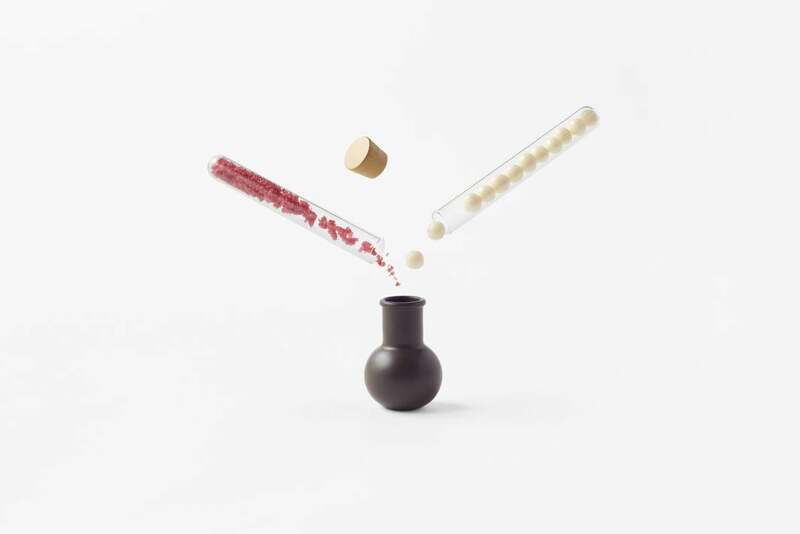 Reinvented chocolate tablets by Nendo that show how design can affect taste. In the runup to Valentine’s Day, chocolatiers everywhere are bending over backward to outdo themselves with elaborate heart-shaped bonbons in the hope of turning the heads of romantic chocoholics. When it comes to the humble chocolate tablet, with its straightforward, no-nonsense, snap-off grid, chocolate-makers usually save the design for the packaging, which you can feast on with your eyes but has nothing to do with actual taste. 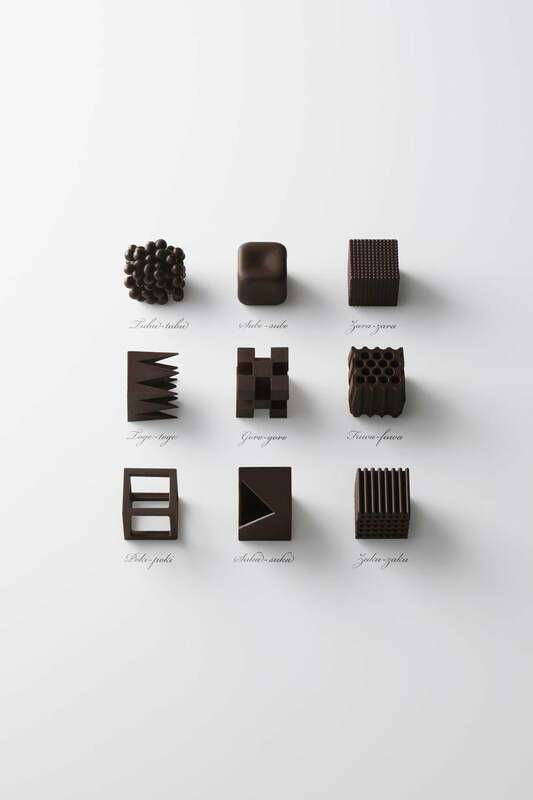 But always inventive Japanese designer firm Nendo has created a riff on the standard chocolate tablet that both reinvents the boring slab into something more sensual and visually interesting, adding a textural component to heighten the eating experience. The firm first experimented with the form by creating a series of chocolates to mark Nendo’s Oki Sato as Designer of the Year 2015 for the Paris design trade show Maison et Objet. The idea behind “chocolatexture” was that although chocolate snobs tend to focus on aspects such as country of origin and cacao percentage, the shape of chocolate can also affect its flavor. Nendo created nine different configurations of the same bite-sized chocolate with pointed tips, hollow interiors, and both rough and smooth surface textures. Nendo’s chocolate experiments from 2015. 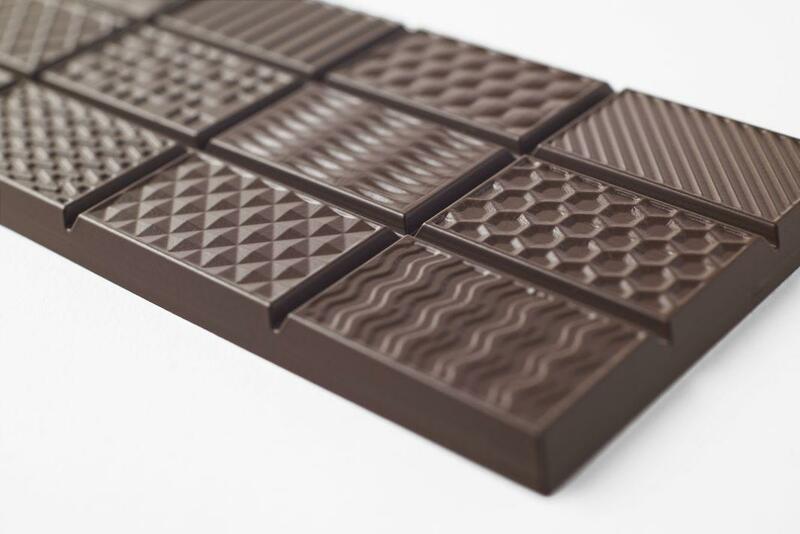 So this year, they built on that idea by creating the “chocolatexturebar,” a single bar of chocolate whose surface is divided into 12 squares with diversely textured faces—stripes, dots, zigzags, checkered, and wave patterns. 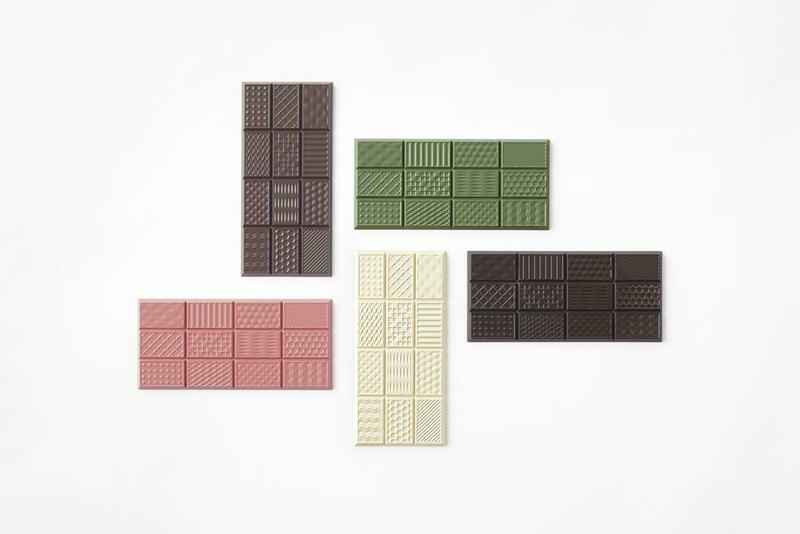 “By tasting each face with the tongue,” Nendo says, “one can enjoy a new taste dimension that is unlike any other conventional chocolates.” The chocolate tablets come in milk chocolate, strawberry, white chocolate, bitter chocolate, and matcha flavors. 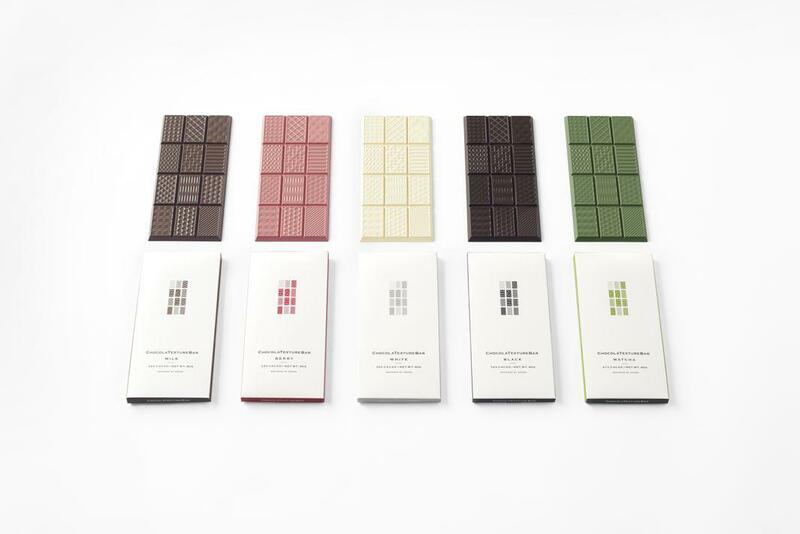 This year, Nendo also decided to play around with the idea of chocolate fillings with its “chocolamixture” set. 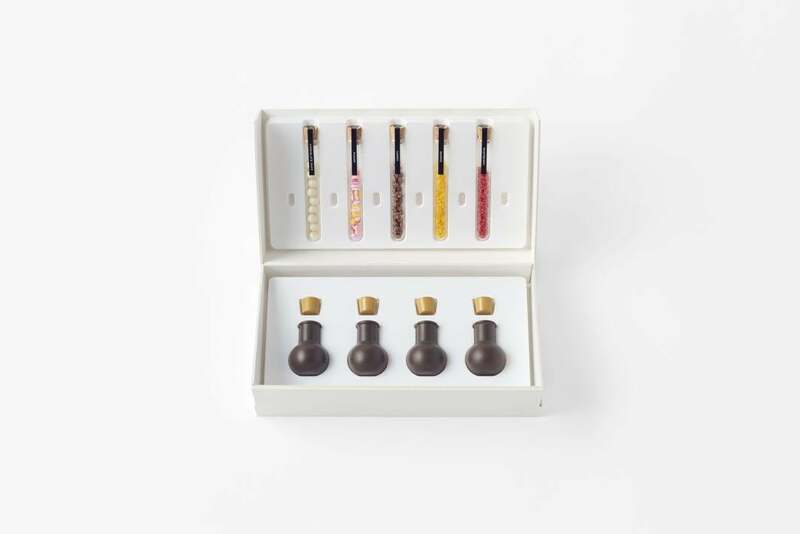 The set allows you to fill hollow chocolate flasks with flavorings—such as freeze-dried mango, raspberry popping candy, and heart-shaped sugar and chocolate puffs—then cap them with fumigated white chocolate “corks” before popping them in your mouth. While the set takes the mystery out of biting into a filled chocolate, it instead offers the chance to play Willy Wonka. The only thing we don’t like about these inventive chocolates? They are only available for purchase in Japan.